It's been all quiet on the blogging front from me lately, and for the most part I haven't been writing much of anything else either. I usually love this time of year. I love setting goals, I love smashing those goals out of the park. But I haven't quite learned when to cut myself some slack and I think that perhaps that's a good place to start with goals for 2016. Right this moment, even though it's New Year's Eve, it just feels like a regular old Thursday. One of the goals I didn't manage to complete in 2015 was to read 110 books, which was 10 more than the 100 I managed last year. There are a few excuses I could give, one of which being that I started studying online, on top of continuing to work four days a week. But at the beginning of December, I was pretty determined that I was going to make it. 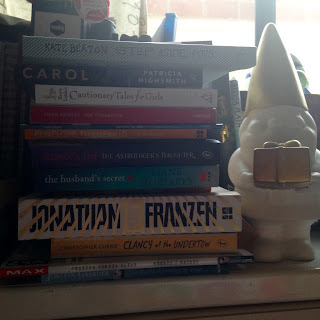 I worked out that I needed to read about thirty books in thirty days to make it, which seemed do-able until I realised that one of those books was Jonathan Franzen's Purity which was good, but also quite long. Anyway, I think I am sitting on a tantalisingly, horrifyingly frustrating tally of 96 and unless I can manage to read fourteen books (or even four) tonight, I am just not going to make it. I like my sleep way too much. But the upside of this sudden reading sprint was that I did manage to read fifteen books in December, which is incredible. I think I was aiming for around ten every month with a bit of wiggle room for big books, and I hardly ever managed it until now. It helped that I chose real page turners. So here is Nigel the Santa Gnome, minding the teetering pile of what I read this month. You can't see them, but on the top of this pile are two short books: Mark Forsyth's The Unknown Unknown and Chimamanda Ngozi Adiche's We Should All Be Feminists. Aside from the fact that just about everyone I have mentioned this book to has said they always think Jostein Gaarder is a a woman named Justine Gardner, I have really nothing to say about this book. I found it dull. It was really hammering home an environmental message, it was told in a confusing manner but using overly simplistic language, and I just found it so bone crushingly dull I couldn't even bring myself to read it on public transport. Yes, I was one of the hordes who flocked to their television sets when Netflix released its original series, Jessica Jones starring Krysten Ritter and David Tennat. And it was good. And I was very much obsessed with it. It got to the point where I was googling information about all the other Marvel Cinematic Universe films which I hadn't seen in order to try and fill the gaps between them. But aside from that, that show was so good that I simply had to go to the comic book store and get the first volume of the comic. (By the way, people who think paperback novels are expensive in Australia, you should try buying comics. Ouch!) I read the whole thing in one sitting and I found it really interesting but it did lack some of the grit and sass of the series. I was pleasantly surprised by the lack of grotesque oversexualisation of the female superheroes, too. But the series was infinitely more complex. You can read my review of this book by clicking here. This is one of those spooky classics that is published in the popular Penguins range, and I picked it up on National Bookshop Day. Shirley Jackson was also the author of the short story The Lottery, which was once banned in America, about a small town which once a year holds a rather gruesome raffle. That story was partial inspiration for The Hunger Games but you will have to read it to see why. We Have Always Lived in the Castle is about Merricat (Mary Catherine) and her sister, who live in a castle on the top of a hill with their Uncle, avoiding the townspeople as much as they possibly can, as many of the townspeople believe Merricat's sister is responsible for the deaths of the rest of their family who were poisoned one night at dinner. It's eerie and quite interesting but I wouldn't say I am an instant Shirley Jackson fan. This is the book that really got everyone talking about Liane Moriarty. When Cecilia finds a note from her husband which is labelled 'To be opened in the event of my death", she begins to be haunted by the possibilities of what might be contained inside. Her curiosity will have disastrous consequences and shed light on the answers to questions being asked by several others around her. Just like when I read Big Little Lies, I was pleasantly entertained by Liane Moriarty's smart and witty approach to domestic fiction. I can see why Moriarty is a million copy bestseller and would recommend her books as great holiday reads. This is a brilliant young adult novel about a young girl whose mother (a well known astrologer) disappears without a trace. Avicenna is not an astrologer but she understands some of her mother's ways, and so she assists the police investigation by reading some of the charts her mother left behind. This book was so great because it introduced me to a world I had never entered before, and it was a cross of a number of different genres as well. Bleak, beautiful, scarily close to the truth. I've read this before, but this play about the life of Alan Turing was based on Alan Turing: The Enigma, which also inspired the movie The Imitation Game. Since doing some research of my own for my current work in progress, I've come to feel like perhaps the characterisation of Turing is a little off in the play but I would have to see it performed to know for sure. There's a film version but it's just not the same. I got inspired to read this when it was used as clues in an episode of Criminal Minds, and now that I have read it I understand why. Frederick kidnaps the beautiful art student he has been watching from afar and keeps her prisoner in the basement of the mansion he has bought with his lottery winnings. They form a strange relationship, each based on their need for the other, though Miranda tries time and time again to escape. The story is told first through his point of view and then through her own diary, and then from his view again. I don't fully understand why this repetition was necessary, because Miranda's view point only revealed that she was often fooling him, something I already suspected. But I didn't find the book particularly creepy, and maybe that just means I've watched one too many Criminal Minds episodes. Short stories for the modern woman taking elements from classic fairy tales. Danielle Wood talked about this collection at the Perth Writer's Festival earlier this year and I just knew I had to buy it. I am so glad I did. This book was originally published as The Price of Salt, and was put out under a pseudonym. It was Highsmith's second book, right after her hit novel Strangers on a Train, and her publisher didn't want it so she had to take it elsewhere. To write about a lesbian relationship in the 1950s was risky, but every week, Patricia would receive letters from readers who told her that the book had changed their lives. And I can understand why-- this book would have been unlike anything anyone had ever seen before. Not only were the two characters allowed to fall in love with each other, but they were allowed to make a go of it. Highsmith writes this complex and charming relationship every bit as well as the situation deserves and I don't even know if I want to go and see the film now that I have read this... The book was good enough. I don't know how to review this comic book properly, so instead I will link to Kate's blog. Written in support of independent bookseller's week in the UK, this essay is all about the joy of browsing, and finding a great book you never even knew you were looking for. Based on her famous TED talk, this essay is rational and makes a lot of sense-- feminists do not all have to be unfashionable, unhygienic, angry, man-hating monsters. Just look at Chimamanda! The woman is stylish but she does it for herself. I think I read somewhere that this essay has been made required reading in some Scandinavian country. So that's the lot of it. Phew! That took forever to write. It's hard to believe that after all of that reading, I didn't even make it to 100 books this year. I got so close! This has been a year of almosts. I almost read 100 books. I almost won the John Marsden Award. I almost won Young Bookseller of the Year. I almost did a handstand in yoga. Just some things to think about later tonight when I am setting some new goals, I suppose. To all of you who are still reading this, Happy New Year. I hope 2015 has been kind to you, and even if it has not, I hope that good things are coming to you in 2016. Happy New Year and good luck with your goals for 2016!